David Ceolin, Water, acrylics mixed with gloss medium on canvas, 20 in. x 16 in. What made you decide to have a solo exhibition? 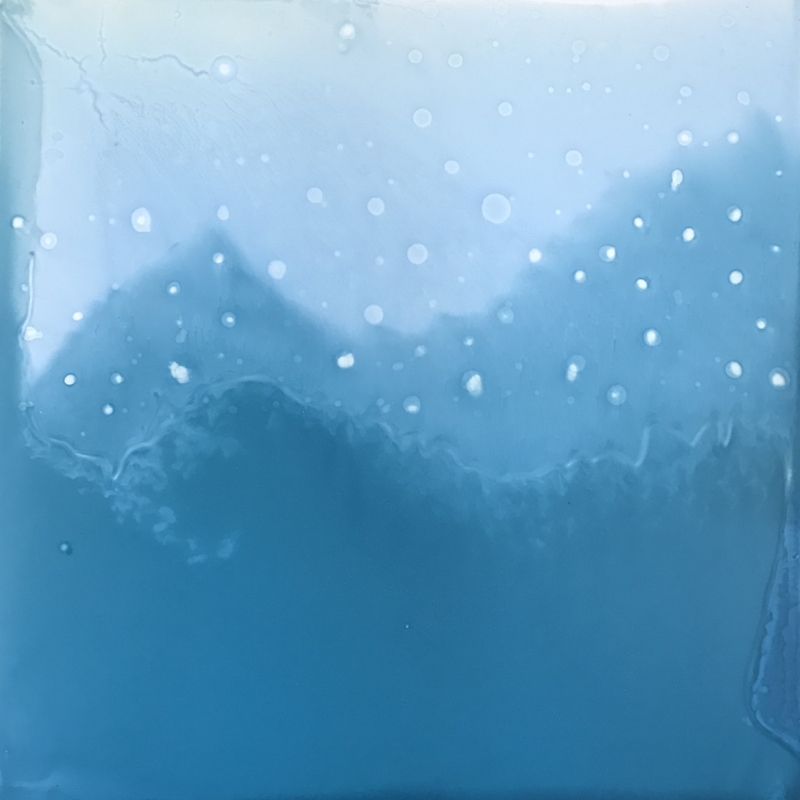 My exhibit at Twist will feature an array of mediums such as gloss and matte mediums combined in unique ways with acryllics and inks, almost emulating the feel of multiple artists, even though I am the only artist featured. What are you trying to communicate with your artwork? We live in an interesting world where innovation advances are staggering, yet we are still subject to nature and its power. To communicate this, I apply a modern feel to natural landscapes. Since much of my work is done in close proximity to outdoors, I am continually amazed by the colour palate and power of the natural environment. My early work was solely acrylic based. Then I began to combine these with gloss mediums and matte mediums and I was absolutely blown away by the layering effect that began to emerge. Some of the works almost feel encaustic in nature. The bold colour range of acrylics when mixed with gloss or matte mediums produces some incredible colour results, and the feedback has been very good. It began when spending time at my cottage and being intrigued by how the blue green waters and colourful range of sunsets worked in concert to create a bold palate every day. David Ceolin, Lakeside, acrylics mixed with gloss medium on canvas, 4 ft. x 4 ft. I get inspiration from many places. Sometimes music, cinema, or theatre can inspire me to make a bold turn with an art piece. I truly believe all of the arts are comrades in arms in igniting the passion for artists in various disciplines to create new and bold works. What does ‘being creative’ mean to you? I am also an entrepreneur and the process of creating something from nothing in both disciplines are very similar. Both require one to be imaginative, resourceful and determined. Are there any artists that influence your work? I am always impacted by a range of artists that inspire me. Erin Crysdale a talented Toronto-based artist was very influential in encouraging me to further push the idea of the mediums combined with acrylics. Sometimes as an artist you are unsure of new works, and the generous feedback and encouragement of other artists can inspire you to push further with your nascent approaches. What’s your favourite thing you’ve ever created? Why? One of my early favourites was a work in which I first combined gloss medium with acrylics called Lakeview. It was an attempt to capture the blue water and sun soaked colour palates, and I was extremely happy with the results. That is one of the great questions of art! In many ways less is more, and I have learned the lesson to resist the temptation to continually tinker. It’s like leaving the table a bit hungry after a meal, and usually you actually find that you feel full later. I am leaving the canvas a little “hungry” and it works. 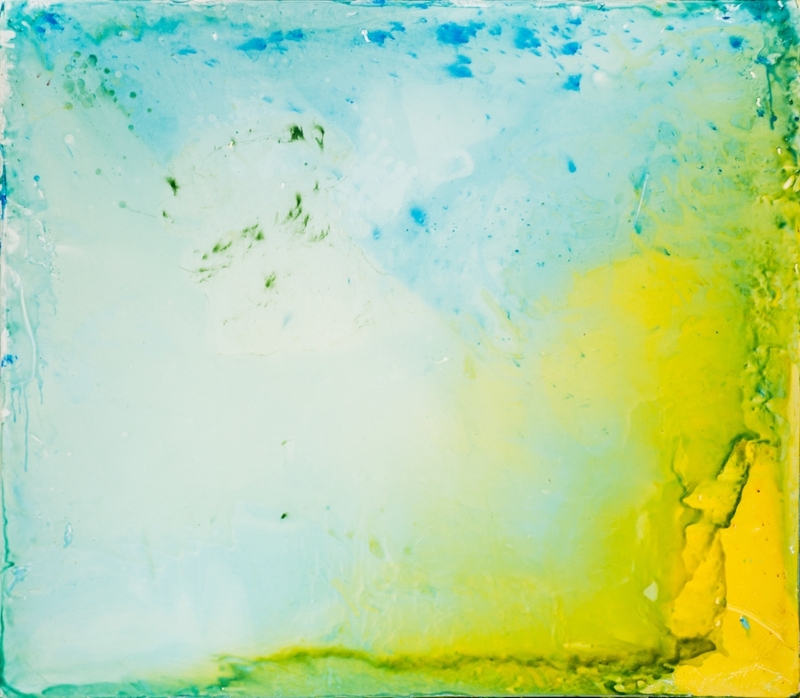 I think encaustic is fascinating and I will endeavour to go there someday. It’s a whole new set of media, processes and tools and that evolution excites me. I am beginning to work with inks and they are proving to be interesting whether used alone in simple shapes or combined with the liquid mediums and poured on the canvas. What would you say has been your biggest creative challenge? The biggest challenge is always the courage to show new works to outside eyes. I love to see the reaction of people I don’t know to my work. 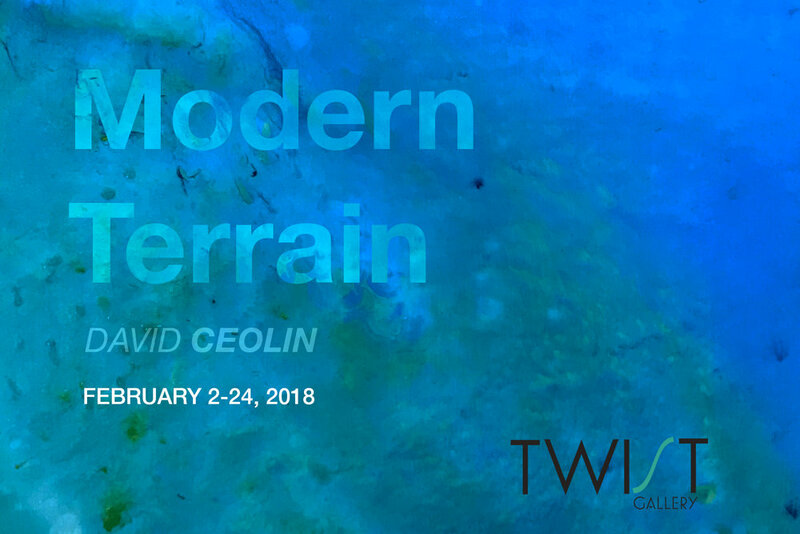 David Ceolin's solo exhibition Modern Terrain will be exhibited at Twist Gallery from February 2nd-24th, 2018.